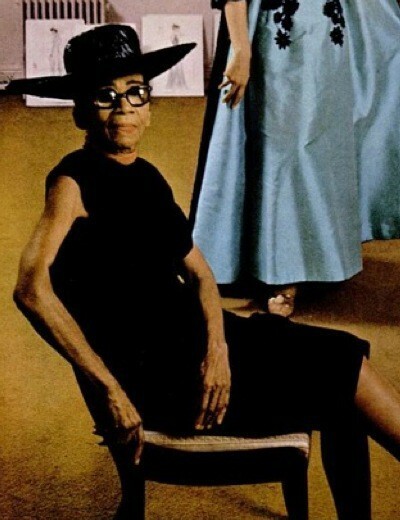 Ann Cole Lowe was an African-American, born in Clayton, Alabama, USA, in 1898. Her mother was a seamstress and Ann learned how to stitch at a very early age. She and her mother moved to New York, and Ann married Mr. Cohen. They had a son Arthur who died in 1958. Ann's mother operated a small dressmaking shop. When her mother died, Anne completed the dresses she was making and carried on the shop. At the same time to learn dressmaking in a more professional manner, she joined the S.T. Taylor Design School and graduated from their fashion design course. In the early 1950's Jacqueline Bouvier met her and ordered some of her dresses. When she became engaged to John Kennedy, she decided to get her wedding dress made from Ann Lowe, as well as 10 dresses for some of the other ladies at the wedding. Ann Lowe worked hard, but was not very financially minded, and her tax records were lax. The I.R.S. decided that she owed them a lot of back tax and seized her shop in 1961 while she was in hospital having an eye operation. But when she came out she found some anonymous person had cleared all her debt. It was always supposed that this generous person was Jacqueline Kennedy. Ann recovered, and opened a boutique in Saks Fifth Avenue in 1961. The same year she was awarded the Couturier of the Year Plaque by New York Fashion society. She appeared in the National Social Directory and 1968 Who's Who of American Women. She also opened a new store on Madison Avenue in New York, which did very well. She made more than 2,000 dresses for the society ladies of New York, and was well known for using the "trapunto" technique in her dressmaking. Five of her gowns are now in the permanent collection of the Costume Institute of the Metropolitan Museum in New York. Others are in the Smithsonian Institution in Washington, and the Black Fashion Museum in Harlem. Anne Cole Lowe retired in the 1970s and died in 1981 at the age of 83. There is a very interesting book "Threads of time: the Fabric of History" by Rosemary E. Reed Miller published by www.toastandstrawberries.com which covers the stories of 16 African-American women fashion designers including Anne Cole Lowe, which shows how ideas have changed about culture, fashion and clothing over the period of about a century.